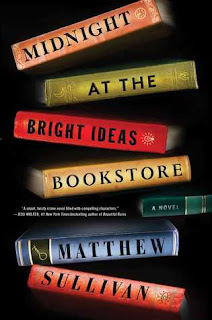 Midnight at the Bright Ideas Bookstore by Matthew Sullivan is a very highly recommended, clever, appealing mystery with a likeable protagonist. Lydia Smith, thirty, is a clerk at the Bright Ideas bookstore. When Joey Molina, one of her so-called "BookFrogs" (regulars who spend most of the day in the store), commits suicide on the third floor of the store just before closing time, she is devastated. She is also surprised to discover that twenty-year-old Joey has a picture from her tenth birthday party in his pocket. Joey also, inexplicably, left her name as the one to contact to inherit his meager worldly possessions. Lydia collects the books he seemed to have left for her, but the books are oddly defaced and may contain some sort of message. As Lydia tries to figure out what was happening in Joey's life that led him to suicide, her traumatic past and buried memories begin to intrude on her thoughts. His suicide brings back terrible visions of her childhood when she suffered a traumatic event that changed her life. When Lydia's picture runs in the paper, it does help her best friend from that time, Raj Patel, reconnect with her, but it also helps a detective find her again. The answers about Joey's death seem to lead Lydia to reexamine her childhood and a twenty-year-old cold case. This is an excellent novel. It is well paced, with an intricate plot that and a perplexing mystery. Along with the plot, Sullivan seamlessly describes and establishes an astute sense of place for all his characters. The characters are wonderfully realized - unconventional and realistic. Lydia tells the present story and what is happening to her today. Flashbacks are told through her father's point-of-view to explain part of what happened in Lydia's childhood, until Lydia remembers what she experienced. It is perfectly presented and flows seamlessly from one part of the story to the next, past and present. 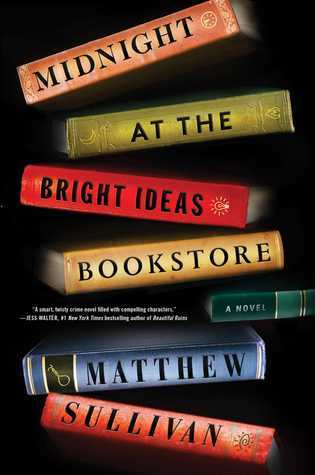 I was entranced by and riveted to every page of Midnight at the Bright Ideas Bookstore. Not only is it an excellent, clever novel, it's hard to believe it is a debut novel. I really liked the character of Lydia and her other friends at the bookstore. It's rather nice to have a great summer read with a likeable character where you want everything to turn out for the best.